Ryugu is a strangely dry space rock. Japan’s Hayabusa-2 spacecraft has sent back its first data on the asteroid, and surprisingly it appears to have nearly no water at all. Hayabusa-2 arrived at Ryugu in June 2018 and has since dropped off three landers and taken one sample of dust from the surface. It has also taken pictures and measurements of the asteroid’s surface composition. The first analyses of the data were presented today at the Lunar and Planetary Science Conference in The Woodlands, Texas. The asteroid’s spinning-top shape and equatorial ridge suggest that it may have once rotated about twice as fast as it does now, completing a full turn in under 4 hours. It could have been gradually slowed down by the force of sunlight hitting it, says team member Seiji Sugita at the University of Tokyo. The measurements also showed that Ryugu’s surface is fairly uniform. It is extremely dark, reflecting less than 2 per cent of the light that hits it. Comparisons with meteorites we have collected on Earth – which were heated as they passed through our atmosphere – show the colours match, suggesting the asteroid was heated up in the past, perhaps when it was chipped off from its parent body. That could also explain why there seems to be very little water on the asteroid – surprisingly less than the asteroid Bennu, which is the target of NASA’s OSIRIS-REx mission. Based on where Ryugu probably formed, it is unlikely that it was dry from the start, says Sugita. “Our preferred scenario is that the parent body acquired water and then subsequently re-expelled most of the water,” he says. Because Ryugu’s surface is so homogeneous, its parent body may have lost its water through heating from radioactive materials rather than being hit by other objects, which wouldn’t affect the entire asteroid equally. “Some people are disappointed that it’s uniform everywhere,” says Sugita. But, he says, that also means that all of the different components are well-mixed, so a sample taken anywhere on the asteroid should have bits of every kind of rock that is there. 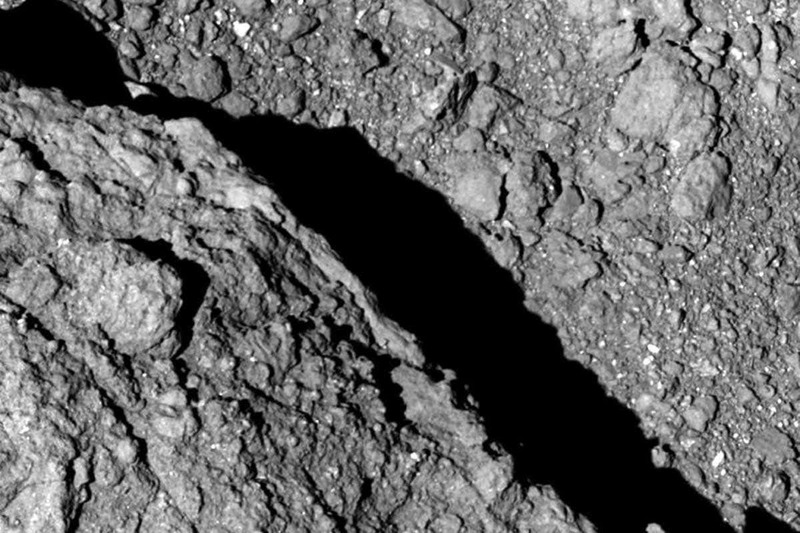 Researchers have long thought that asteroids like Ryugu may have brought water and other ingredients for life to Earth in the distant past. If it turns out that many of them, like Ryugu, don’t have any water, we may have to recalculate and look for the font of life elsewhere.